Across the country this holiday season, over 45 million baby birds will be killed and eaten for thanksgiving dinner and over 22 million at Christmas. Babies(? ), you’re asking. Yes: humans have altered these majestic birds to become very large, very fast in order to maximize profit. In reality, they are babies when they are killed; just a few months old. As attentive mothers, the females were very protective of their children. After building a nest in a hidden spot, she would conceal her eggs with grass and leaves while searching for food. 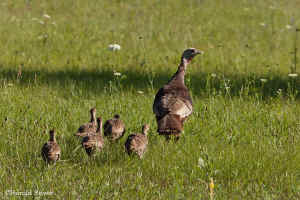 Young poults stayed with their moms for many months to learn the ropes of living the turkey life. They lived up to ten years. Across the country this holiday season, over 45 million baby birds will be killed and eaten for thanksgiving dinner and over 22 million at Christmas. Babies(? ), you’re asking. Yes: humans have altered these majestic birds to become very large, very fast in order to maximize profit. In reality, they are babies when they are killed; just a few months old. 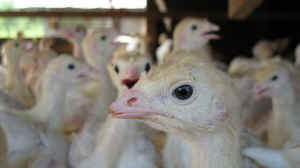 Most people who eat turkeys are vastly disconnected, as I was at one time, to their story, their suffering, and their past. While the turkeys eaten by humans look very different from their ancestors, they have similar desires to roam, forage, roost, build nests, travel in flocks with friends, and raise their children. Yet, most turkeys are denied all of this and much more. 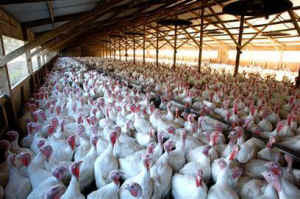 They are forced to live in large crowded buildings; each turkey has at most a mere three square feet of space to move. Turkey missing portion of beak These babies are not allowed the comfort of their mother nearby who, with her wings, would cover them while they sleep to protect them and keep them warm. She is not there to soothe them with her coos. Without anesthetics, a portion of the turkeys’ sensitive beaks and toes are removed with a hot blade to reduce the aberrant behavior of hurting one another under such stressful conditions. Due to the constant ammonia fumes from their waste, they are highly susceptible to respiratory diseases which are addressed with antibiotics added to their food. Many young birds die under these barbaric conditions. When the baby turkeys are killed after just 3-6 months, they are hung upside down by their feet on a moving rail which takes them to a tank of water that is electrified. As with other species, the tank frequently doesn’t render the turkeys unconscious. So, fully aware and frightened, their throats are cut and they are boiled alive. It’s a nightmare far beyond ropertiswhat any being should endure, and what any person of compassion should find acceptable. Many companies are selling animal flesh labeled “cage free,” “humanely raised,” or “organic” to combat the growing awareness of the suffering so many species endure. While a small minority of turkeys spend their short lives partly outside, their bodies struggle in the same way to support excessive muscle mass, they exist solely to be exploited for their flesh, and they are killed in a barbaric manner. To learn more about humane slaughter, click here to watch a video and read a thoughtful article. I think you will realize that there exists a pervasive humane myth, that these labels mislead the public, don’t reflect the truth and distract people from questioning the ethics of eating other beings regardless of how they are treated. Consider for a moment that the turkey you may plan to eat for Thanksgiving was allowed to peck at the ground, spread his wings and enjoy the earth beneath his feet for a short time. Can we as a society justify ending his life when there are so many other foods to eat that don’t cause such harm? Aren’t we called upon to question any tradition that involves the infliction of unnecessary violence upon another? TurkeysWhile the Thanksgiving holiday is intended to honor gratitude and peace, how ironically tragic that so many dinner tables feature the body of a being that had suffered and been killed to satisfy one’s habit, tradition, and palate. 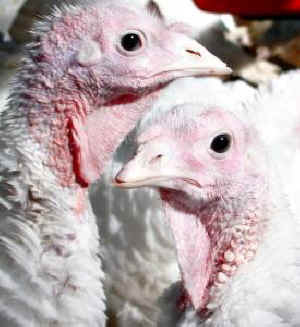 We at Catskill Animal Sanctuary believe that there is no such thing as “humane killing” or “humanely raised” turkeys. We believe that today can be vegan and the future is vegan. So, instead of serving turkey for the holidays, how about serving compassion with a vegan fest? Now is the time we can all take part in ceasing the massacre of other species and creating a cruelty-free tradition of abundant plant-powered cuisine. We encourage everyone to reflect upon Gandhi’s wise words, “We must be the change we wish to see in the world,” and find your path toward peaceful living.